In a recent act, we have clearly seen that the Personal beef Big Brother Naija Housemate, TBoss has for fellow housemate, Efe shows no sign of ending, as TBoss once again attacked Efe yesterday. During a discussion with Debie-Rise, TBoss said “ Efe is just down to earth in the Big Brother Naija house because he lacks exposure to a number of things”. 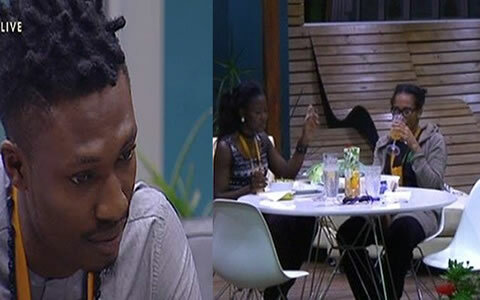 Later, Housemates earned a reward that they were to enjoy collectively last night from Biggie. They took their meals and sat down to enjoy the food, but Debie-Rise took her position of reward outside to the garden and she was followed by TBoss. As the pair dinned, they also seemed to share a congratulatory “smirk”. TBoss remarked to Debie-Rise that she had done exactly what they both had spoken about earlier, which was to sabotage the Tasks as much as possible in order to ensure that the team would not reach a meaningful points tally. The ladies joked at the fact that the other Housemates didn’t even notice their pranks and seemed visibly pleased with themselves for getting a one-up over their rivals. Note that, the four Nominated Housemates are still up for possible Evictions at the next Live Evictions show coming up this Sunday, and it would be curious to see if the concocted plans by TBoss and Debie-Rise will work to their favor.